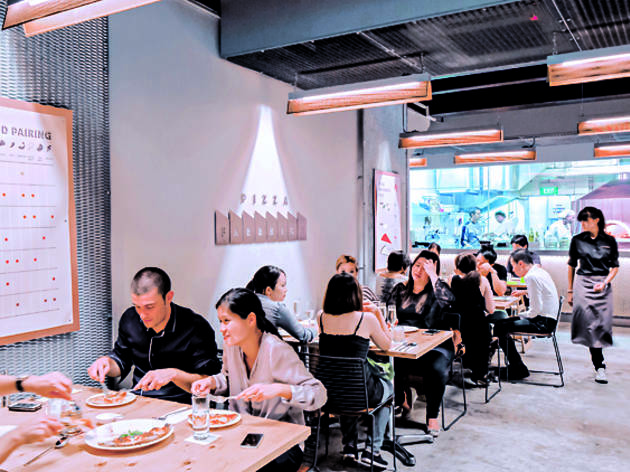 Wood-fired pizzas and craft beer land on the quiet side of Bussorah Street, with Spanish chef Matteo Boifava – who’s spent three months at Heston Blumenthal’s Fat Duck part of his culinary experience – heading the kitchen. 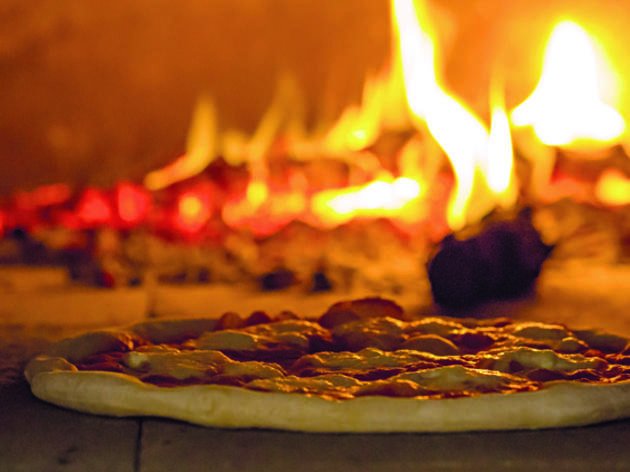 Pizza Fabbrica is a brightly lit two-unit spot on the quiet end of its row. 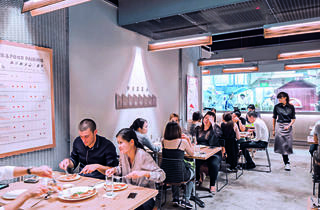 Cement and copper set an edgy tone, but the industrial coldness is taken down a notch with attentive and friendly service, strategically placed spotlights and helpful posters recommending beer and wine pairings with its pizzas. The rustic and traditional dishes are paradoxical to its interiors – Boifava channels more of his Italian roots than cutting edge Blumenthal innovation. A pedestrian plate of four small slices of bruschetta ($10) just about ticks all the right boxes in flavour – it’s just missing a brightness, or more umami from the tomatoes to justify the price. The bowl full of mussels ($20) makes more of a statement with extra briny meat paired against tomato, garlic and a light hand of spice. A good section of the bigger plates is dedicated to pasta mains like the fregola ($24), which the menu claims is served with clams and shavings of bottarga. 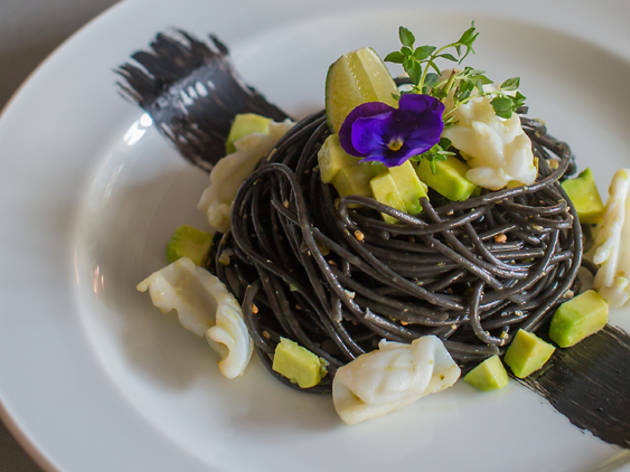 What arrives instead is a generous plate of tri-toned semolina orbs with twirls of too-chewy squid, crunchy shrimp, limp scallops and an overpowering note of burnt toast. 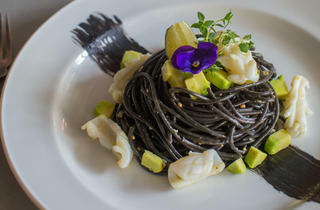 While this particular pasta is usually cooked a little more brown to lend a nuttiness to the dish, our plate was perhaps charred a touch too far. Fabbrica’s pizza thesis is fulfilled in ten traditionally topped red ($18-$26) and four white ($20-$24) pies, all cooked in a hulking centrepiece copperclad brick oven. The crusts are almost crunchy, with toppings like prosciutto, parma ham, sausage, salmon and tuna. To pair with the food, the restaurant currently serves three beers on tap – Peroni ($10), Hitachino Nest White Ale ($12) and St Austell Proper Job IPA ($12) – at a premium for its 330-millilitre pours. There’s only one Italian craft brew, the Birra del Borgo Reale Extra IPA ($18). But in the coming months, Fabbrica has plans to bring in exclusive bottlings from Boifava’s homeland to build the largest Italian craft beer list in town. Our meal, flush with missteps, betray the head chef’s pedigree. Let’s hope they’re just teething pains Fabbrica needs to get over. Went to Fabbrica on Friday night and all of us were really impressed with their food and amazing Italian beer collection. 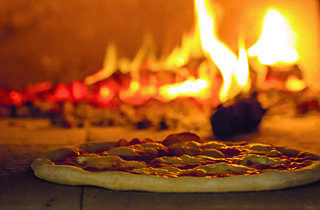 Wood fired Pizzas were incredible and their Pastas were as good as any authentic Italian restaurant. Agree that Italian beers are bit expensive but beers in general are expensive in Singapore as compared to Europe, USA, Australia.